Toshiba has exclusively spoken to TechRadar regarding its much publicised Cell TV, explaining that the television was just too powerful for the European market. AV enthusiasts have been drooling over Cell TV for getting on two years now. Powered by the same chip that is in the PlayStation 3, the television is out in Japan where the country makes good use of its eight HD tuners, massive set-top box component with hard drive and 4k picture quality. While this sort of technology, was teased and shown off in the UK it never actually arrived. 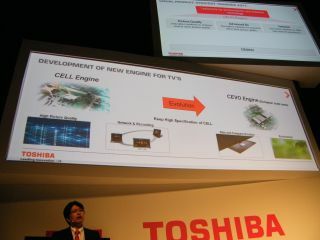 Then Toshiba chose IFA 2010 to announce that Europe would see the arrival of Cevo and not Cell – a modified chipset which will be built into Toshiba's next generation of TVs out Easter next year. "Cevo uses Cell DNA but has been modified for the European market," explained Andrew Line at Toshiba to TechRadar. "The technology has been optimised to suit Europe, which doesn't need eight HD tuners but does need things like catch-up TV, access to the web." When asked if would ever see Cell TV on UK soil again, Line noted: "At the moment it's not the right fit for Europe and we have to hit the right price point, which we will do with Cevo." Easter 2011 is the proposed UK release date for Cevo TVs, but this may well change depending on market conditions. From what we've seen, Cevo will bring a lot of what Cell TV does in Japan but without the accompanying set-top box and at a cheaper price, so we can't wait for CES 2011 where we will hopefully see some of the TVs in action.